An export transaction typically begins with a request for a quote from the buyer to the seller. The quote almost acts like a contract by stating that certain goods or services will be provided for a set price within a set period of time. If the buyer accepts the quote, it constitutes an agreement between both the buyer and the seller. There are a lot of things that need to be included in the quote for both parties to benefit. Especially if it is someone’s first time preparing a quote, I would strongly advise using an export quote worksheet to ensure that all the needed information is gathered. Again, since a quote for an export transaction is an agreement between the buyer and seller it is very important to have all the information that is needed to write up an accurate, legitimate quote. With the suggestion of using an export quotation worksheet to help with writing a quote, Template for export quotation worksheet can be downloaded, edited and printed off from Microsoft® Word or Excel. These particular export quotation worksheets are my personal favorite because you can customize them with your personal logo and business details. 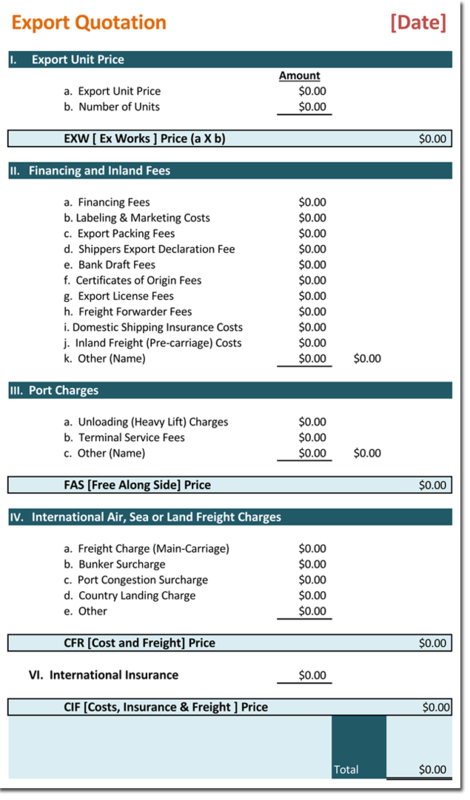 More often than not, you’ll come across an export service quotation worksheet that is very bland, however the templates let you personalize just about every detail so that it’s known the quote is for your business. These templates are 100% free and can be downloaded right away. You can save the templates to your computer and use them whenever you need to write up a quote. Aside from just being able to add your own logo and business details, you can attach notes, terms, conditions, and anything else that you feel should be on your quote. I believe that this template is the easiest to use and most personalizable export quote worksheet.